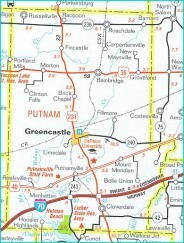 The North Putnam Community School Corporation serves students and families in the Towns of Bainbridge, Roachdale and Russellville and Clinton, Floyd, Franklin, Jackson, Monroe, and Russell Townships in Northern Putnam County. High school students are eligible to take classes at Area 30 Career Center and Ivy Tech Community College. Several high school classes qualify for college credit with Ivy Tech Community College. North Putnam Community Schools Homepage – CLICK! Links are provided to each school in the corporation. Indiana Department of Education – Annual School Performance Report – CLICK! Indiana Department of Education – School Corporation Data Website – CLICK! Information about individual schools can also be obtained at this website. AdvancED has merged with North Central Accreditation and now reviews all of the schools in a district. Starting with the 2005/2006 school year, the State of Indiana changed the definition of “high school graduate” resulting in lower graduation rates. Other schools in the county have similar statistics. Source – School officials and Indiana Department of Education.